Day by day and inch by inch, iconic institutions are “watering down” their standards to the point of the danger of complacency. The Miss America Pageant is the latest target. I read the talking points on the Miss America press release and I spoke to a board member who serves on the Miss America board along with communicating with former Miss Americas and contestants. I understand this is a hybrid mess of issues that includes the former Miss America Board, #Metoo Movement, sponsors and ABC’s supposed requirements for a national audience. I understand this is a difficult time of rebuilding and re-branding the Miss America Pageant. So is lowering the standards of competition the answer? Here is my take on how I used the exceptional skills in pageant competition from the Miss America Program to achieve my wildest dreams. First of all, I am not an exceptional person. I was born into a family whose father did not complete the 10th grade. We lived in an old tenant house and struggled to make ends meet. Our “food stamps” were Daddy growing cabbage in the winter. I was told I looked like a boy with my short hair and over-sized lips. I was diagnosed with Dyslexia and discouraged from attending college. I was fired from my part-time job as a teacher. I have a low IQ and struggled to be accepted to Columbia College in Columbia, SC. I entered college on academic probation; Daddy paid for my college tuition with cucumber rebate money and a government grant. I even worked in the tomato fields to help Daddy send me to college. Then I was exposed to the Miss America Pageant. Now, listen to this—The Miss America Pageant was everything I knew I could become but I also knew I was not. It was a standard of excellence to be physically fit, have great communication skills, develop my talent and create a sense of style. Whether we want to admit it nor not, this is success in life on steroids. Miss America became a fast-track experience for me to achieve personal excellence from top to bottom. What is the net-net? For me, I gained confidence to tackle my dreams. I won more than a “rhinestoned” crown. Through my training from the Miss America Program, I had the opportunity to give back, help others achieve their dreams, and pay for my graduate school studies. I was recently inducted into professional Speaker Hall of Fame, I wrote two best-selling books, my comedy is featured on SiriusXM Radio, and I am a professional singer. AND there are lots of MEs out there who have done the same thing and much greater under the influence of the exceptional standards of Miss America Program. I can only wonder if I would be experiencing the same level of success in life if the new rules of Miss America were in place when I was a contestant; if the pageant system was not as exceptional as it has been in the past? Would I have just settled for mediocre? As I said, I was not born an exceptional person but I made a decision to become exceptional because of the high standards and rigid competition of the Miss America Program. So I ask you, why is being exceptional becoming more unacceptable? Great points about being Exceptional. Youth organizations, including FFA, 4-H and Boy Scouts, continue to offer opportunities to excel. Organized sports offer similar opportunities, including reaching a peak in the NFL:, NBA, or Olympics, for example. Talent and interviewing skills (extemporaneous speaking) are important skills. But eliminating “appearance” from the Miss America competition is like removing home runs from baseball. I am a first-generation college graduate and had never thought I could have been one. I was an accomplished pianist but incredibly shy. The assertiveness training that came through MAO and affiliated activities led me to become a multi-business owner, non-profit founder, congressional liaison, patient advocate, on-air personality and leader of NCI regional cancer program. Like Jane, I wasn’t ‘the swimsuit’ category candidate but one many swimsuit awards (among others) in my local preliminaries. I believe that this organization at its core IS a swimsuit pageant (due to its start) & did not agree with its move towards bikinis. This competition category accompanied by interview, evening gown and talent with the tenets of the crown-Scholarship, Success, Style and Service provides an opportunity for personal development and membership in a network like no other. Modifying this pageant brand and format does not solve the socio-political issues facing women in our society. Our MAO contestants’ platforms are a forum to exhibit independence, direction, issues ownership through solution-oriented abilities. MAO and it’s members inspire girls and young women daily and on multiple levels. The outward appearance of Americans as a whole are a result of other thoughtless policies, marketing campaigns, digital addictions, and unrealistic demands on an individual-all negatively impacting their health. Proper nutrition, physical activity and stress management doses are key to a healthy lifestyle but most challenging as part of America”s commitment to individual and public health. I am confused why MAO believes that it can elevate and support a role model who isn’t an honest ambassador of the MAO brand, which has a huge audience of followers across every generation. Jane…just shared your article…I love it…and dang it NO….nothing wrong with being exceptional! Pastor said he wanted to acknowledge it was a “ painful” day for many and be understanding of that and avoid any celebration. I felt positively chastened for having birthed 2 children that survived. I have experienced loss and grieved alongside beloved women who experienced loss . I’m not advocating becoming insensitive. But it’s just awful when we can’t celebrate or acknowledge or simply be happy for anyone for anything at all that might possibly upset or offend or make a single soul feel excluded. Not even being a Mother. This has been a bee in my bonnet for some time- thank you for your post and letting us chime in. Love your article, Jane!! I’ve always appreciated the challenges that the Miss America program provided for me to become a better ME! I did not like the organizations move for women to wear LESS clothing by requiring bikinis during the swimsuit competition, because it seemed more “cheesy” to me…. girls are basically in their bras and underwear on stage! Thus, I sent a letter to the leadership of the MAO expression my thoughts when that change was made. I am not a “Feminatzi”… I LOVE being a woman and love being treated like a lady! But, I think we need to act like a lady in order to be treated like one, and that’s where I think there is a place for modesty! Not some “Victorian” idea, but a lady with class! The one piece swimsuits, in my opinion, were classy and not so revealing! The evening gown competition should not be removed or changed. What’s wrong with a woman dressing beautifully!!??? Looking her very best?? I’ve always thought that the interview and talent were hallmarks of the Miss America program that set it apart from other “beauty pageants”, because not only is it about our outward appearance, but also about our ability to think, express ourselves well, and share our talents with the world! As I’ve said before, a participation trophy for everyone is ridiculous, and doesn’t encourage excellence! We’ve created for ourselves an “entitled” generation. Vicki- you are a favorite one of my Miss Scs since you always stood up for what you know is right and I have always admired you for your convictions. This is what makes the program excellent- women like you who have PARTICIPATED and understand what being a strong woman is all about. I think the MAO has not connected the dots of what the competition does to enhance all who dare to try. We need more VICKI HARRELLS! Jane, in watching you professionally over many years, I believe you have modeled being “exceptional” but not “exclusive”. The work you have done for others with no fanfare and no audience is evidence. While the MAO was a catalyst, I believe your heart, your faith and your family are the unseen essentials to your success…and that was destined in whatever path you took. Thank you, Barry! I am thankful the Miss America Program helped me organize my skills and improve. It was truly a high standard of excellence that more could benefit from being involved. Even volunteers are chiming in as to what the program did for them. 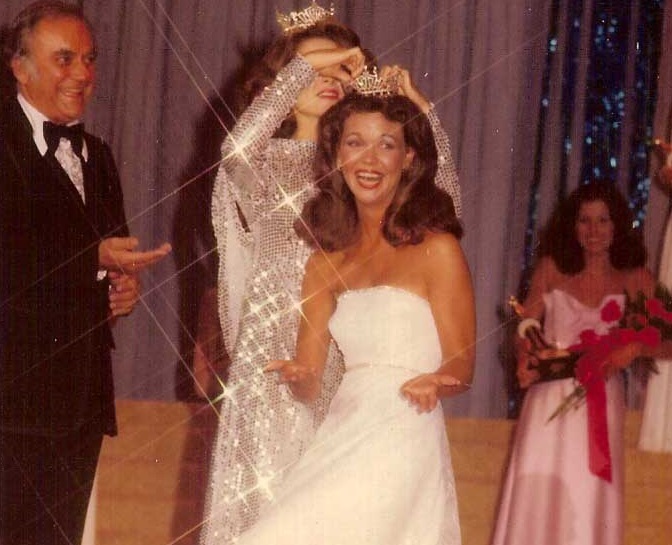 Miss America has long “arms”; the program needs to connect those involved with the R O R.
I ran the Ms. Florida World pageant for 11 years as well as being the director of several others. I also started pageants of my own. Our participants had a wonderful time, received star treatment, received money, opportunities, contracts etc. Although I don’t think bikinis are necessary, one piece bathing suits are “the bomb” and evening dresses are stunning. I think many of the changes are good, however I would still vote for the swimsuit and evening gown as a part of the pageant, and many people don’t realize how important the talent portion, interviews and the final question are. So true, Gayle!The general public has NO idea how powerful these competitions are to enhances lives. There need to be a pageant called, there she is…..the ones who lost the crown but really won bigger in life. Gracious! I remember you so well! What a blessing to share the Miss America experience during that time! Let me know what you are doing!!!! Exactly! And I will continue to say that being MA is by its very nature one of THE MOST EXCLUSIVE CLUBS IN THE WORLD. Not many women can compete that this level, having to be exceptional in so many areas of life. By making it “inclusive” they are lowering the bar to a point where it is nothing but so so average. So heartbreaking. Well stated, Jane! Thank you for putting into words so eloquently a sentiment I am feeling not just about the MAO but our culture overall. As an observer and not a participant, I agree with what you and so many have said on here. I liked it much better when all the girls wore the one piece swimsuits and walked gracefully in them, not prancing as they seem to do in their bikinis. I have watched the pageant for many, many years and I have seen it lose some of it’s luster. My thought is that the Miss America pageant will be gone soon after they make all the new changes. I’ve always said “If it ain’t broke, don’t fix it.” It wasn’t broken, but I’m afraid the breaking is about to take place.